After an extensive renovation project, the Lord Jeffery Inn in downtown Amherst reopened to the public on Jan. 9. 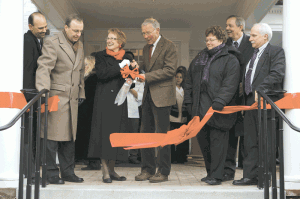 Doing the honors at a ribbon-cutting ceremony are, from left: Robert Reeves, general manager of the inn; John Musante, Amherst town manager; state Rep. Ellen Story; Charles R. Longsworth, chair emeritus of the Amherst College Board of Trustees; Biddy Martin, president of Amherst College; Rob Winchester, president of the Waterford Hotel Group; and Peter Shea, treasurer of Amherst College and president of the Amherst Inn Co. 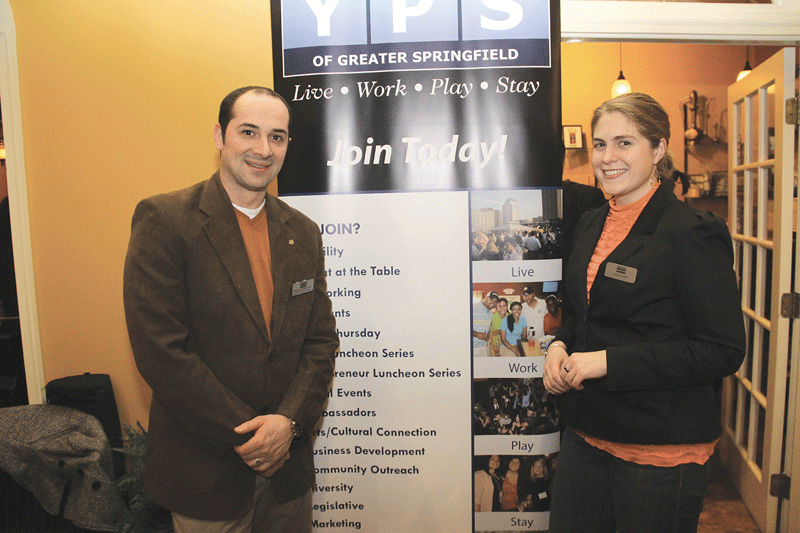 The Young Professional Society of Greater Springfield recently staged its monthly Third Thursday event at Nadim’s Mediterranean Grill in East Longmeadow. Top, Nick Gelfand, owner of NRG Real Estate Inc., with Christopher Rinaldi of Excel Technologies Inc. Bottom, board Member Ron Laprise, owner of Laprise Chiropractic, with Laura Judd. 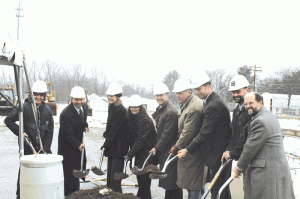 Groundbreaking ceremonies were recently staged at the site of what will become known as the Northampton I-91 Professional Center, which will consist of two three-story Class-A office buildings designed for professional and medical tenants. 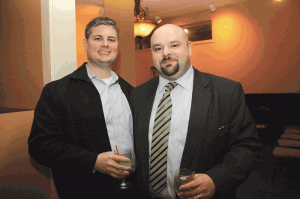 The project is being spearheaded by Agawam-based Development Associates. From left are: David Masiello, owner of R.P. Masiello, general contractor, the builder chosen for the project; Travis Ward, operations manager for Development Associates; Suzanne Beck, executive director of the Northampton Area Chamber of Commerce; Eileen O’Leary Sullivan, co-owner of Northampton I-91 Professional Center; Ken Vincunas, general manager of Development Associates; J. Curtis Shumway, co-owner of the Northampton I-91 Professional Center; Northampton Mayor David Narkewicz; Brian Huntley, project manager for Tighe & Bond, the engineering firm consulting on the project; and Pat Levelle, CFO of CSO, a future tenant.